Nemeroff Law Offices handles numerous slip and fall accidents every year. Slip and fall cases typically involve a wide variety of defective conditions which cause the fall, including sidewalk deviations, defects in flooring, defects in walkways, holes in park lots, holes in flooring, merchandise left on the floor in stores, tools or equipment left in places where they are no supposed to be and substances which on the grounds in places where it is unsafe. This list is not all inclusive. There are an infinite number of ways for a slip and fall accident to occur. Slip and fall accidents frequently result in serious injuries. A fracture to an ankle or foot, and injuries to the knee including tears of the meniscus or ligament are common. Many of these injuries require surgery to fix the damage. Other common types of serious injury in slip and fall accidents are injuries to the shoulder resulting in tears to the rotator cuff or labrum, resulting in frozen shoulder and surgery. Sometimes, serious traumatic brain injury can occur from a slip and fall accident. From a legal perspective, slip and fall accidents are frequently difficult cases to prove requiring extensive discovery in litigation to uncover the facts necessary to prove the case. On a positive note, many slip and falls occur in places and buildings that have significant insurance coverage. By virtue of this insurance coverage, most people who are seriously injured in slip and fall accidents will at least have sufficient insurance coverage available to pay a claim if the necessary elements can be proven to win the case. First, you must show that the thing that caused you to fall was defective or negligent in some way. Having pictures of the place where you fell is often a vital part of proving the case. The injured person or their family should take photographs immediately when an accident occurs. Without photographs, it is often difficult if not impossible to prove the case. Hiring an experienced Chicago personal injury lawyer immediately can be vital to the success of the case, as that lawyer will try to get photographs of the accident scene immediately if you have been unable to do so yourself. Accident scenes can change quickly, and the preservation of the evidence is extremely important to the success of the case. Second, you must show that the at-fault party, the landlord, property manager, owner of the business or other responsible party had “notice” of the defective condition before your slip and fall accident. This is often the evidence we do not have at the time we meet our client. Our firm has had tremendous success in the cases it has handled proving the “notice” element. Notice of the defective condition can be proven in a few ways. One is that the negligent party had “actual notice” of the defective condition before your slip and fall accident. They knew of the defective condition and did not take appropriate steps to fix the dangerous condition before your fall. If the negligent party created the dangerous condition, that is considered “actual notice”. In many cases, the people responsible for the property claim that they did not know about the defective condition before your accident. Under those circumstances, we can prove “notice” by what is known as constructive notice. Constructive notice means that the person/company responsible for the property, in the exercise of due care, should have discovered the defective condition before you fell. Nemeroff Law Offices lawyers are highly trained to uncover this type of evidence. We have had enormous success on slip and fall cases because of our highly trained lawyers who understand how to uncover this evidence during the discovery phase of a lawsuit. Insurance companies and the attorneys they hire to defend slip and fall cases will attempt to destroy or limit your case through a variety of ways. One is by filing a motion for summary judgment, asking a court to hold as a matter of law that your case should be dismissed because you cannot prove key elements that are necessary to prove. Frequently, they will file for summary judgment, alleging that the plaintiff is unable to prove what caused her to fall, that they cannot identify the defective condition which caused the fall. The failure of the plaintiff and her attorney to prove what caused they fall is fatal to the case. An experience slip and fall lawyer will understand what is necessary and how to prove this element of damages. Another common basis for filing a motion for summary judgment to dismiss the case is that the plaintiff is unable to prove the element of notice, that the defendant(s) had notice of the defect before you fell. This element is discussed above. An experienced slip and fall lawyer will understand how, during the discovery process, they can request documents and take depositions to prove the notice element. The lawyers at Nemeroff Law Offices are experienced slip and fall lawyers who understand what it takes to defeat summary judgment when notice is at issue. Another defense frequently used is that the defective condition was open and obvious. 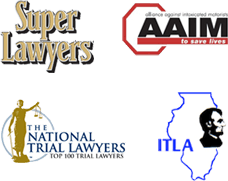 Illinois law does not allow a person to recover for injuries they sustained on an open and obvious condition. It is a great irony of personal injury law that a condition can be so bad and so obvious that they person/company who allowed their property to get that way may not be legally responsible for the consequences. In most if not all slip and fall cases, the defense alleges that the injured person was contributorily negligent in causing the fall. In other words, either partly or full at fault for the accident. In Illinois, the injured person has a duty of care to be free from their own negligence. If an injured person contributed to their own injury, a determination will have to be made as to the percentage of negligence the injured person had versus the negligence of the defendants. If a person who is injured is found to be more than 50% at-fault for causing a slip and fall accident, they are barred from recovery and money damages for their injury. However, if am injured person is 50% or less at-fault, then they are entitled to recover money damages for their injury, reduced by the percentage they are at-fault. For example, if a slip and fall victim is determined to be 10% at-fault for causing a slip and fall accident, and their injury damages equal $500,000, then that $500,000 would be reduced by 10%, making the case value to be $450,000. It is important when pursuing a slip and fall accident injury case not to ignore the issue of contributory negligence. Nemeroff Law Offices lawyers are highly trained to either eliminate contributory negligence on their client's slip and fall cases, or keeping the percentage of contributory negligence as low as possible under the circumstances of the case. Many times, Nemeroff Law Offices hired liability experts, engineers, architects, safety specialists and other qualified experts to help prove that the defendants were negligent or the injured client was free from contributory negligent. Hiring the right expert to assist in the case can many times be the difference between winning and losing a case. The Chicago personal injury lawyers at Nemeroff Law Offices have the expertise to win your slip and fall case. The experienced slip and fall lawyer can make the difference between a fair recovery and losing. Call the lawyers at Nemeroff Law Offices now for a free consultation. The number is (312) 629-8800. To find out more about what the Nemeroff Law Offices can do for you, please read our slip and fall accident case study.